Love is a universal value. Romance is admired around the globe. Marriage is magical. But has the honeymoon lost some of its meaning? Nowadays, many newlyweds feel that they would like to give something back and make their honeymoon more meaningful. They have been showered with wedding gifts and they have a comfortable Western life ahead of them. Together they would like others to share some of their good fortune, their togetherness and their happiness. What better way could there be to do this than to spend a part of their honeymoon helping orphaned children, helping to teach English in a village school or helping to build a new classroom? There are so many ways that honeymooners could spend a week or two together making a difference in a less fortunate community. Projects Abroad has great places for honeymooners to stay when they are with us. They are still looked after by our brilliant host-families but they have their own separate living quarters. Perhaps not super-luxury but definitely comfortable and definitely apart! We work in famous honeymoon destinations like the coast of Thailand and the Isles of Fiji and great romantic cities like Rio de Janeiro and Cape Town. You can also find us in more adventurous places like Vietnam and Peru. In Ghana, we can receive honeymooners in Cape Coast and live by the ocean while helping on our building project or in an orphanage, school or hospital. 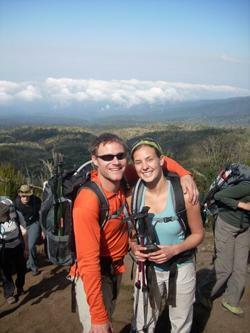 In Tanzania, you honeymooners could even combine a breathtaking safari with helping the poorest communities in Arusha. The choice is yours. Our job is to make sure that your project is worthwhile and meaningful, and that you are really part of our community, even if you can only spare as little as a week. But it is your honeymoon so we promise not to wake you up too early in the morning. If you would like to join us on your honeymoon, please go to the Application and complete the form. Please make sure that you choose "Yes" to the "Travel Companion" question (which is on the third page near the end of the form) and type the name of your future husband or wife and the word "Honeymoon" in the box underneath. We'll do the rest!